With extensive time invested by our Research and Development sector, we have come up with a new premium quality product. 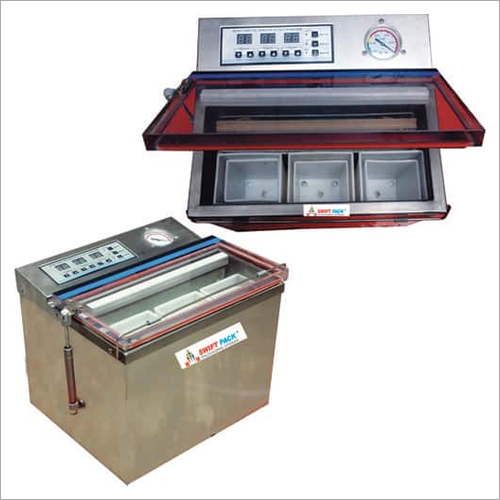 Thinking about the best way of increasing product shelf stability naturally, Vacuum Packing Machines has gained prominence in India in the recent years. Our company has now developed the Tea leaf vacuum packing machine. This would help in retaining the aroma and natural freshness of tea leaves, thus giving customers a taste of fresh tea every time. Giving an added advantage of keeping the moisture content at check, this is one of the most widely used product in tea companies and ration shops. Another positive factor that plays a major role in this products extensive sale, is that since the packet is a definite briquette shape,almost 10% more material can be loaded in export containers Easy to set up and easy to use, this product reliable and extremely economical.